Ikaros Villa is located on the ground floor and consists of a room with beds, a fully equipped kitchen with fridge and coffee machine, a bath with shower and a furnished terrace. The studio is air-conditioned and there is a satellite TV. From the terrace, you can have a spectacular view to the sea partially on the mountains. It is ideal for families with children or couples. 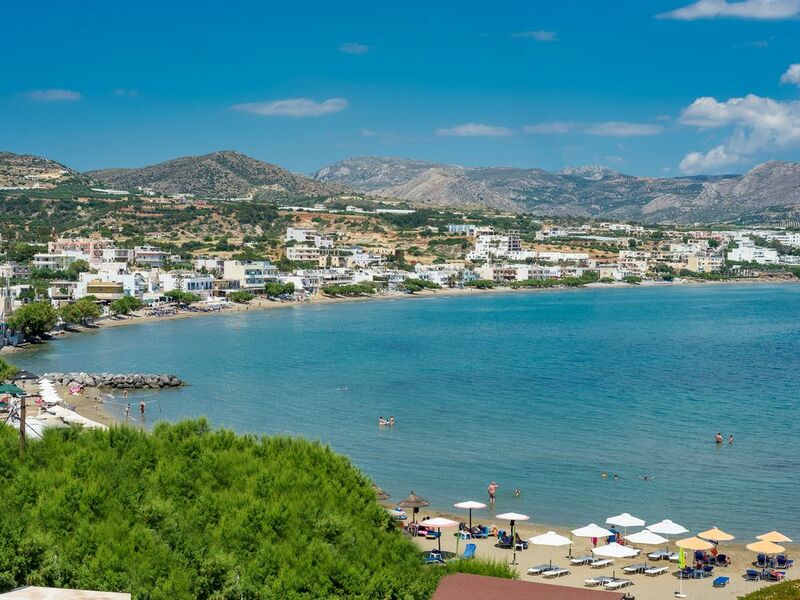 The vacation studio offers safety for the children.The peaceful area, the sparkling water, the long and not crowded beach, a plenty of other sandy or pebble beaches, the Greek Filoxenia of the people offer a nice combination for really relaxing holidays. Makrygialos is a fantastic location for a get away from it all holiday. It is very beautiful with great beaches and a small harbour with restaurants and bars. Ikaros Villa is in a great location beside a large and quiet beach and only 5 minutes walk from the harbour. The studio is large and functional but was very clean and well kept. Nota was very helpful with fresh towels, bedding ad cleaning as required. Also there is a good strong shower with lots of hot water (which is not always the case in Greece1) and a ceiling fan as well as an air conditioning unit. The terrace is small but framed by lovely flowers and with a great view. I recommend Ikaros Villa and Makrygialos for a chilled out experience of Crete. "TRES BON ACCUEIL, BEAUCOUP DE DISCRETION, DE DISPONIBILITE ET DE GENTILLESSE DE LA PART DES PROPRIETAIRES, TRES BEL ENVIRONNEMENT ET TRES BEAU SEJOUR." "L''appartement est très bien situé à deux pas d''une plage calme et d''un restaurant Stratos que je recommande. L''appartement est propre, très calme et équipé d''une climatisation qui nos a été très utile. Les propriétaires sont sur place en cas de besoin mais très discrets. Si vous allez dans le sud-est de la Crète et voulez vous loger en dehors d''une grande ville touristique, n''hésitez pas à réserver ici." "I proprietare sono stati molto gentili e disponibili. Alloggio dotato di poche attrezzature. Contesto abitativo tranquillo e piacevole ma situato in zona troppo ventilata." "Nous nous sommes rendus à Makrigialos pour réaliser le rêve de mon père de 82 ans, malade et nécessitant de l'oxygène. C'était un défit difficile. Depuis le moment où nous avons réservé le studio et un appartement, Nota et Georges ont mis tout en oeuvre pour rendre notre séjour possible et agréable. Ils ont pris en charge la fourniture d'oxygène et à notre arrivée tout était prêt pour soigner mon père. De plus l'endroit est splendide, tranquille les gens acceuillant. Nous vous conseillons la taverne chez Georges à quelques pas et face à la mer. Le rapport qualité/prix est excellant et de plus ils sont très serviables. Le port est tout proche et très typique. Nous y retournerons"
"tres bon positionnement, tres bon appartement,sejour tres agreable"
The direction from Heraklion airport to Makrigialos is: Heraklion, Aghios-Nikolaos, Ierapetra, Makrigialos. It takes 2 hours by car about. A taxi or a hire car can be arranged for you after requesr. The distance from Heraklion airport is 120 km, Ierapetra 27 km, Sitia 35 km and Vai 45 km. Restaurants, taverns, cafes, super-markets, tourist-shops, bakery, fruit-market can be found in 3-4 min walk. You can taste the cretan cuisine, the local specialities, the local wine and the home made raki. Banks, pharmacies, bike hire can be found in 10 min walk. Are you looking for a winter time break with winter sun? We are the perfect choice for you. In the winter time the villa is available for long term stayers too. You can enjoy a winter break under the winter sun in Makrigialos of Crete who shines most of the winter days. The temperature in the winter time is approximately from 10 – 20 degrees on a daily basis and sometimes could be up to 20 degrees. You can discover the nature with it’s own beauties under the blue clear sky. You can spend a lovely winter with walks around, visit gorges, caves, traditional unspoiled villages, explore the countryside on foot and after it, taste a Cretan Raki with cretan food in a traditional “kafeneio” or enjoy a delicious meal in a tavern along the coastline. Watch the distillation of Raki and the “mazema “olive from the olive trees.